The Big Apple, the City that Never Sleeps, Gotham, the Empire City - no matter what name New York City is called, it has always been an integral part of America - but NYC could have easily have been called the "Capitol of Baseball" from 1949-1956. During this eight year run, (14) of the (16) teams that played in the World Series were located within the New York City limits and a NYC team won every year. Historic Autographs is honoring these great baseball teams with a two-series product that will include ALL of the players from each World Series roster - with each year having its own subset within the series. With rosters that were loaded with Hall of Famers and fan favorites, the Capitol of Baseball is cherished as much now as it was 60 years ago. 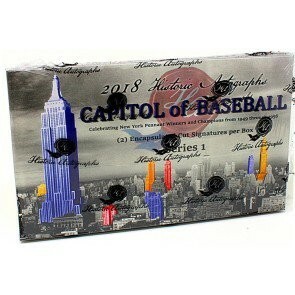 Find these Hall of Famers and post-season heroes in Capitol of Baseball Series 1 - Jackie Robinson, Mickey Mantle, Willie Mays, Whitey Ford, Joe DiMaggio, Roy Campanella, Casey Stengel, Gil Hodges, Elston Howard, Phil Rizzuto, Yogi Berra and many more from the rosters of these great New York Teams.